Lake trout fishing often seems like a contest to see who can go deeper and farther from shore, but as the old saying goes, “there’s a time and a place for everything”. 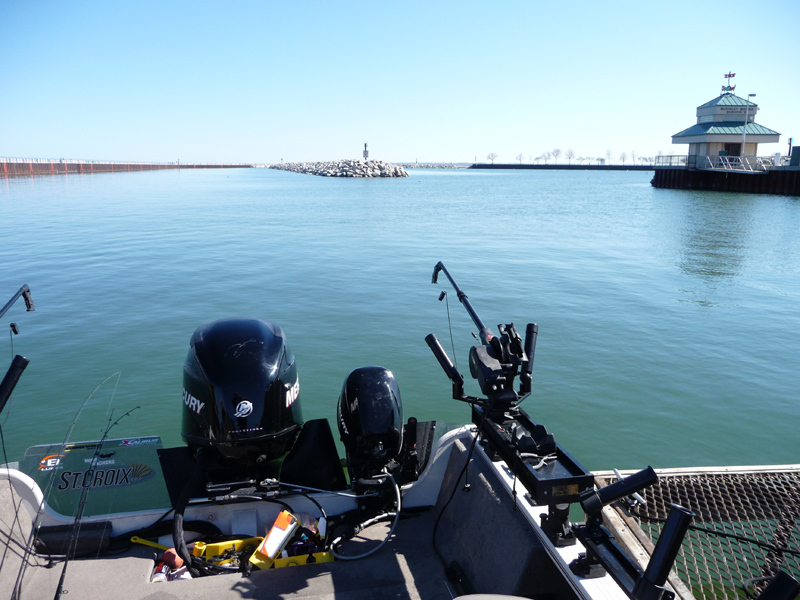 During and just after ice out on Lake Michigan there’s an opportunity to catch lunker lakers in fairly shallow water (10 – 30 feet) and you won’t need a second mortgage to put gas in your boat to find them. 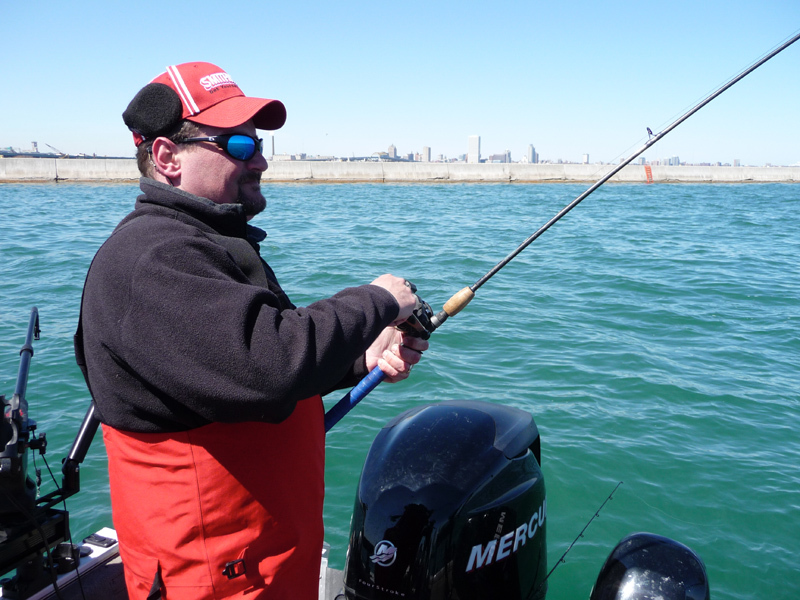 The Milwaukee Harbor is just one good example of where you can use tactics more common with walleye fishing to locate near-shore trout. When the water warms and ice begins to break free of winter’s grasp it doesn’t do so evenly. There are several factors that eat away at the ice in a protected harbor. The Milwaukee River, like virtually all rivers and streams running into Lake Michigan, is warmer than the lake water. So is any outflow from power plants, water treatment facilities, and storm sewer runoff. That warmer water, especially when corralled and guided by the protective break walls, is an attractant for baitfish, and baitfish tend to attract baitfish eaters – like trout. It’s easier to reach these fish because they come up from their mid-winter depths of 100 feet or more to feed on the abundant and shallow prey population. Sure, down-riggers are handy for keeping minnow imitators like Bombers and Rapalas close to the bottom, but on a mid-April trip with Captain Steve Everts we had just as many hookups on inexpensive and easy to operate planer boards with about 75 yards of line running behind them. Capt. 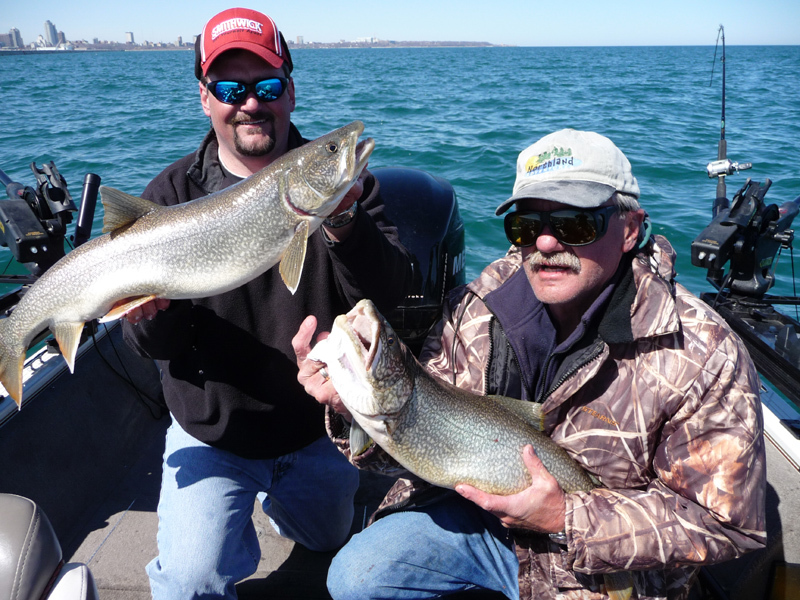 Steve Everts with a client show off a nice Lake Michigan double. those features than out in the mud flats, so it’s a good idea to target them often. Laker trout tend to hang in small schools and an area that produces one or two fish on a slow trolling pass, typically under 2 m.p.h., is worth hitting a second or third time. We didn’t bother to mess with dodgers or spinner blades – just a simple snap swivel on the crankbait and a detachable bell sinker rigged about 30 feet farther up the line was trolled behind a planer board. The fish tend to be fairly aggressive so getting a good hook set without having to yank the rod is the norm. Lake trout are long-lived fish so consider releasing those fat 15 – 40 pounders that may be as old as 30 years. They don’t grow on trees so keep a conservation ethic. Also, early spring is no time to be taking chances with the weather. Wear a life vest and if the wind kicks up have the sense to fish within the protective confines of the break wall. By the way, it’s not just lakers that know about the candy store being open for business – an added bonus might be a big brown trout or even an occasional steelhead that’s answering the dinner bell. And you can’t beat a 2 – 4 lb. coho salmon if you need a few good eating fish to take home for dinner. We hooked into all 4 species in less than 2 hours. If you need a quick cure for cabin fever, you might want to try early season open water on the protected ports of the Great Lakes. The fish seem as anxious to get the season rolling as you. We thank our good friend Dave Roll for these pictures and great information. 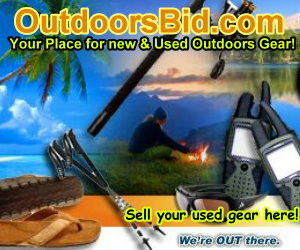 Great Trout Fishing near IL, MN, WI and IA, Try the Driftless Area!